This is a quick post about the proper way to set up the Oculus Rift DK2 on GNU/Linux, which might not be obvious for users not deeply familiar with the X window system. I remember discussing this a long time ago in the oculus forums, back when the linux version of the oculus SDK was doing absurdities such as relying on Xinerama to detect and use the oculus display. Setting up the rift display as an extension of the desktop, is wrought with peril and woe. Thankfully, the X window system is awesome, and used to deal with such diverse multi-display contraptions, back when burly men programmed computers made of pumps, grease, and steel… true story. Recently, I acquired a rather old Wacom Intuos A5 tablet, for reasons I won’t delve into at the moment. It’s an old serial model, and although I don’t have a serial port anymore, I do have a USB-to-serial adapter, which thought would probably work fine with the X.org driver produced by the linuxwacom project, since they do mention support for serial tablets on their website. I plugged it in, followed the linuxwacom documentation about setting everything up in xorg.conf, and fired up the X server. 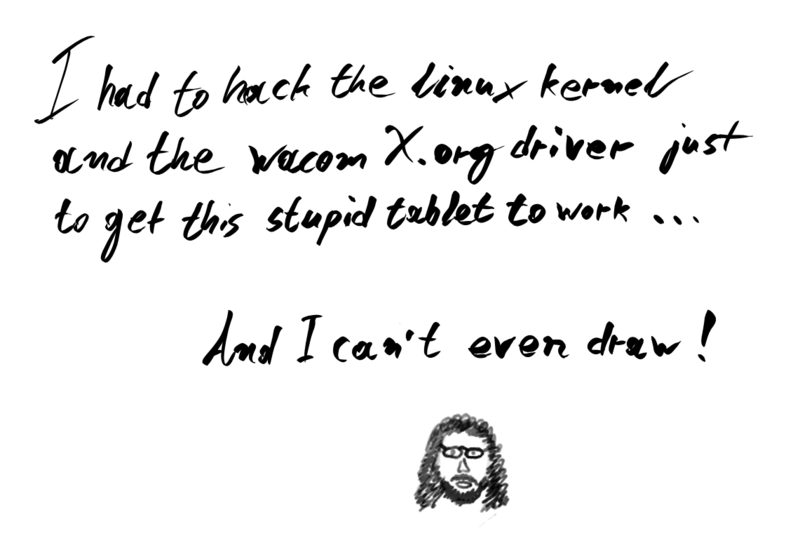 Nothing happened… So I started digging in the wacom driver source. The first problem I encountered was with my USB-serial adaptor. Apparently, the wacom driver used a TCIOCGSERIAL ioctl, which is supposed to return information on a serial device, to determine if it’s talking to a serial or a USB device. If the ioctl fails, it thinks it’s not talking to a serial device, and starts talking USB HID to the tablet. Unfortunately, the pl2303 driver in the linux kernel (as of version 2.6.32.8 that I tested) does not implement the aforementioned ioctl, even though it’s supposed to present a proper serial port to the system. So I had to hack the kernel, and add that ioctl in the pl2303 driver (patch against 2.6.32.8). After a lot of digging around the source of multiple wacom driver versions, it turns out the guys at the linuxwacom project removed the code for old serial tablets from the driver sometime last year! I tried installing a few older versions of the driver (anything prior to 0.9.1 had the serial code), but they would not compile with the much newer X.org headers in my system. Apparently some changes with the XInput extension broke the old driver. So I started hacking again. First I tried back-porting the XInput changes from the newer wacom driver to the old 0.8.4 version, but although I managed to compile it, it would segfault upon being loaded by the X server. Evidently I screwed something up during the backport, which I could have probably fixed eventually, but I realized that it’s a bad idea to get stuck to the old wacom driver. So instead I started from scratch in the opposite direction, re-integrating the old serial code from 0.8.4 to the most recent 0.10.4 wacom driver. 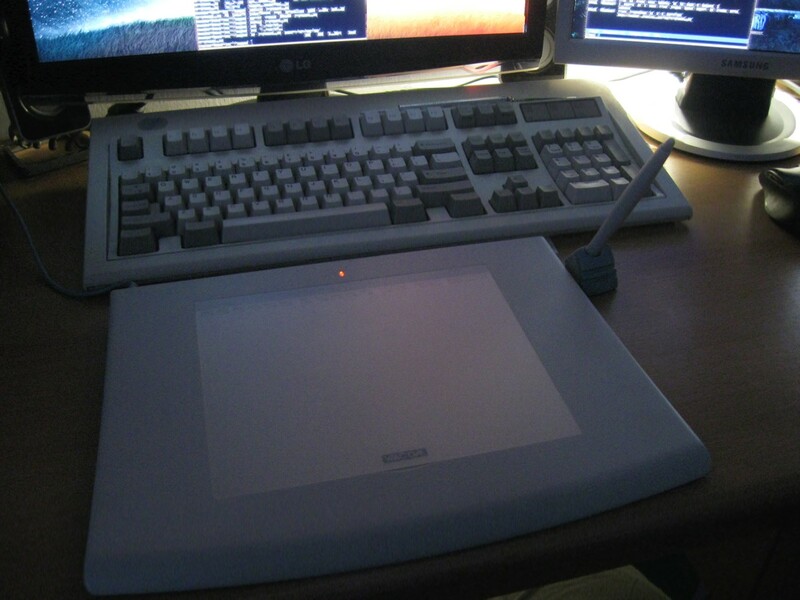 And indeed after a few hours of hacking, I managed to get my serial Wacom Intuos to work perfectly! Here’s the patch in case anyone needs it.